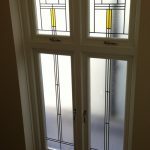 Leadbitter Glass now offer our sandblasted glass protection product free with all single glazed etched glass panels for windows and doors. 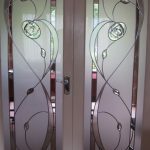 Once the glass has been sandblasted or etched as it is also known, grease marks left by fingers can leave an annoying appearance on the sandblasted areas of the glass. 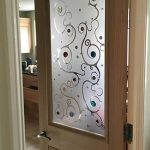 Our Sandblast Protection process will protect the etched areas of the glass and help keep the etched glass panel looking as good as new. 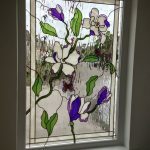 During the sandblasting process, glass is placed into a sandblasting booth and a coarse grit is blasted at high pressure against the glass surface to give it that ‘etched’ finish. 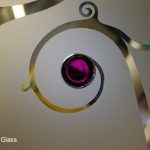 When this happens, microscopic pockets are created in the glass surface and dirt and grease from fingers can come to rest in these areas of the glass once the glass has been handled. 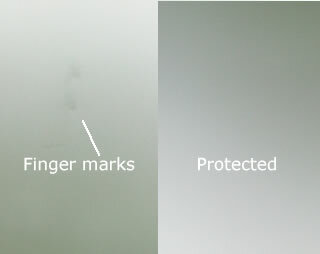 When this happens it can be almost impossible to fully remove these marks from unprotected glass. Our sandblast protection shield is the perfect solution to protect your beautiful new glass from stubborn stains. 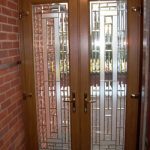 Our clear sandblast protection shield is applied to the whole area of the glass after the sandblasting process and this gives all of the etched areas a protective coating that eradicates most types of permanent marks. 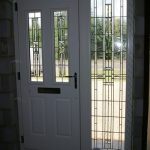 A lot of the etched glass supplied by the Leadbitter Glass Studio is created for double glazed glass sealed units so the protection is not needed as the etched area of the glass is encased inside of the sealed unit. 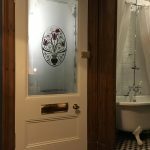 If you are ordering single glazed etched/sandblasted glass from Leadbitter Glass, you will now receive this protection free of charge. How good is the protection? 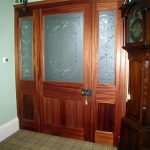 Our Sandblast Protection has amazing properties and it is not affected over long periods of time within the scope of appropriate use. After treating the surface with our Sandblast Protection, the glass is then fully protected against dirt adhesion. Finger prints and traces of other everyday stains stand out a lot less and can easily be removed. Resistance against heat, humidity and UV Radiation are some of the great qualities of the protection. The product can even withstand temperatures up to 200°C without significant loss of functionality. 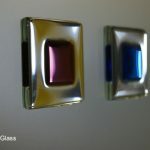 Below are some comparisons against alternative products offered by other glass companies. 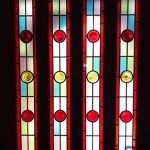 The charts and technical data explains how the Sandblast Protection that is used by our studio, performed after coming into regular contact with chemicals and it also shows results of wear after thousands of cleans and wipes of the glass.